Large cold Japanese Spanish mackerel. Marinated and pickled for 12 hours in the sweet soy sauce base, with yuzu citrus. 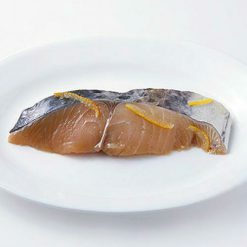 The Spanish mackerel used in this product was caught during the cold season (between November and February). Please note that this dish should not be served cold, and that ‘cold’ is a description of one of the ingredients used. 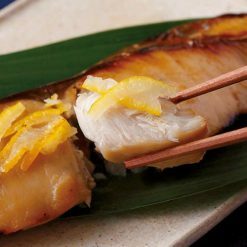 The yuzu citrus peels used in the soy sauce for flavoring is a domestic product. The yuzu used was fresh, and should be less odorous or pungent in comparison to commercial yuzu, to add a subtle flavor. An oily fish related to tuna, mackerel has outer layers of red meat and lighter interior meat. Mackerel are higher-fat fish, rich in the healthful polyunsaturated fats known as long-chain omega-3s, which may help boost heart health. Yuzuan flavoring is one of the most traditional Japanese styles of flavoring and a staple flavor. Sometimes instead of yuzu citrus, kabosu citrus is used as well. During the Edo period (17th-19th century), the style of flavoring fish in sweet and tangy sauce became quite popular. The tradition carries on in particularly traditional and orthodox areas of Japan, such as Kyoto. Serving suggestions include a portion of rice with miso soup and a salad. This dish should get you to readily satisfy your taste buds as well as your daily protein and omega fat intake! Thaw the bag itself in the refrigerator or under running water. Remove the cold mackerel and then fry to reheat and cook. After thawing, please fry or grill using a frying pan. 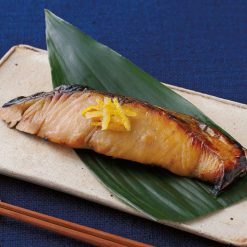 Please be sure not to burn the mackerel, as it is easy to burn due to the sauce coating. This product contains spanish mackerel (South Korean), soy sauce (this product contains wheat), mirin, sake, sugar, chopped yuzu citrus. Origin of ingredients: Spanish mackerel (South Korea). Prepared and packaged in Japan.